European wasps are the perfect soldiers. They’re adaptable, indefatigable and intelligent. They will find and infiltrate any weak spot, they can sting you more than once and are able to shoot venom too. They’ll also hunt you down for a couple of hundred metres if you threaten their nest, as CoreEnviro Solutions senior pest and weed officer, Jim Bariesheff was reminded on Wednesday. 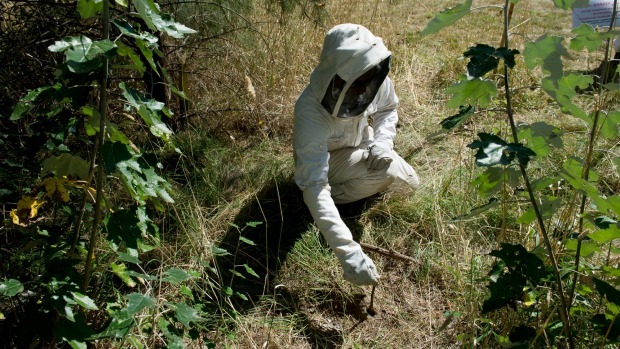 His team are working to find and eradicate the monstrous nests hidden around Canberra as European wasp season fast reaches its peak, and he expects the number of reports to come to a head soon as the wasps start producing drones and queens, trebling the size of their nests. 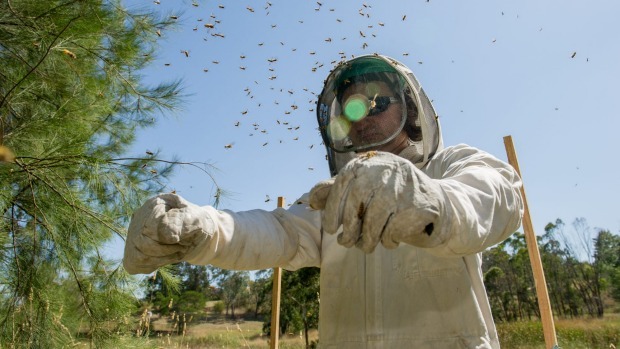 “The nests aren’t often visible, so people stumble upon them, they tread on the nest and once you step on it hundreds of wasps come out and they sting multiple times,” he said while nursing a burgeoning lump on his arm through his sturdy beekeeping suit. 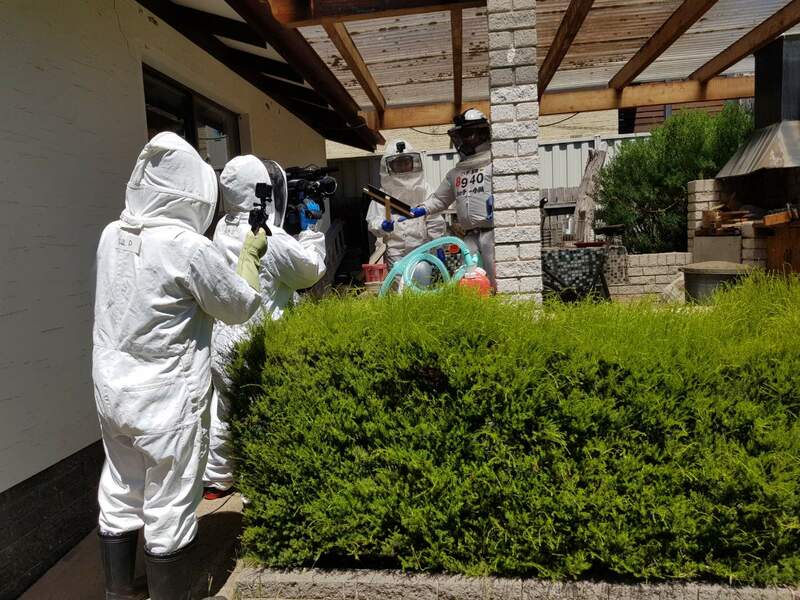 This season European wasps have been reported around Canberra picnic areas, outdoor dining areas, coffee shops and gardens but of late, they’ve taken to nesting within roof cavities, CoreEnviro Solutions invasive species officer Jenni Connolly said. 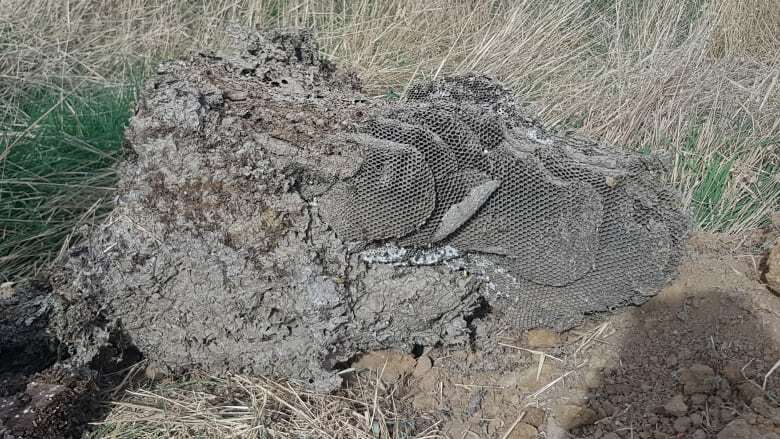 So far more than 100 nests have been confirmed around the ACT but after last year’s whopper wasp season where more than 700 nests were detected, she’s urging people to report them sooner rather than later – especially as they’ve been known to eat through roofs in Canberra and spill into houses by the thousands. “This year their favourite nesting place is up in roof cavities, possibly because of spring rainfall. 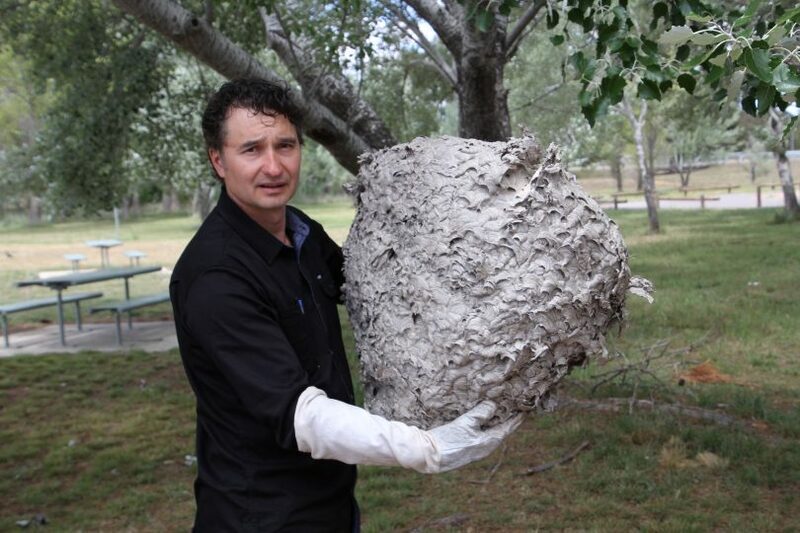 They can eat through roofs and walls to expand their nest and the nest will actually collapse into lounge rooms, living rooms, bedrooms. We’re getting reports of this happening at the moment in Canberra. It creates a really safety hazard for people,” she said. Winter usually kills them, but Ms. Connolly said they’re fast adapting and building larger nests. She said there have been no deaths in Australia yet, but the wasps do have the potential to kill. The team has heard of people pouring kerosene on their nests, flooding them or attempting to block their exit holes. Their unequivocal advice is to do none of the above. “When people block holes when they’re in the roof cavity, they will eat through the gyprock. That’s when they fall into living rooms,” Mr. Bariesheff said. 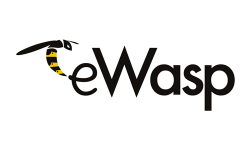 Instead, they advise you use the eWasp mobile app, which launched last month, to report and map Canberra’s European wasp nests. Failing that, you can report them to the hotline on 6258 5551 or via the website: www.ewasp.com.au. All untreated public land nest reports will remain on the mobile app map until the nest is treated, then the pin will disappear. Private land reporting’s will not be displayed on the map. “These nests can release several thousand queens at the end of autumn and each queen is capable of setting up her own nest next season. Every nest we get this season is at least 100 less next season,” Ms. Connolly said.